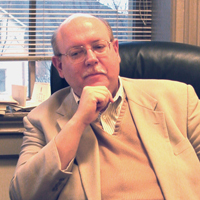 Vincent J. Cornell is Asa Griggs Candler Professor of Middle East and Islamic Studies at Emory University in Atlanta, Georgia. From 2000-2006, he was Professor of History and Director of the King Fahd Center for Middle East and Islamic Studies at the University of Arkansas. From 1991-2000, he taught at Duke University. His published works include thirty-eight articles, three books, and one book set, including The Way of Abu Madyan (Cambridge: The Islamic Texts Society, 1996) and Realm of the Saint: Power and Authority in Moroccan Sufism (Austin, Texas: University of Texas Press, 1998). His most recent major publication is the five-volume book set Voices of Islam (Westport, Connecticut and London: Praeger, 2007). This comprehensive introduction to Islamic religion, thought, life, and civilization includes chapters by 50 Muslim authors, including many of the premier scholars of Islamic Studies. Dr. Cornell's interests cover the entire spectrum of Islamic thought from the doctrinal and social history of Sufism to theology and political philosophy. Currently he is the project director of the project, Toward A Muslim Theology of World Religions and is also working on a genealogy of the problematic of Islam and democracy. Since 2002 he has been a key participant in the annual Building Bridges seminars of Christian and Muslim scholars conducted by the Archbishop of Canterbury.